Want to buy a car? 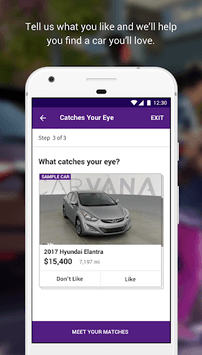 Cars.com's free car buying app helps you find new and used cars and trucks for sale near you. Use our extensive set of filters and sorting options to narrow down your choices to your perfect car. 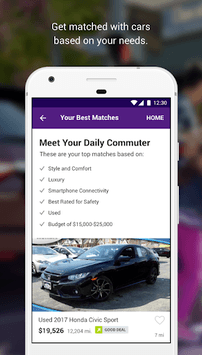 Research different models, compare cars, and find the perfect dealer or private listing. Our tools make buying cars easy by allowing you to quickly find information about a car while on the lot, calculate auto loan payments, and find the Black Book value of your car. Already have a car? 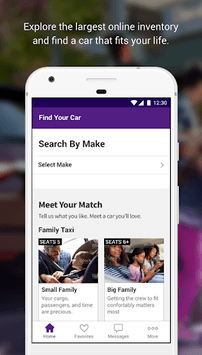 Use our app to find a shop, estimate repair and maintenance costs, or sell your car. Zero in on your perfect car using our extensive list of filters. Narrow your search by year, exterior and interior color, fuel type, transmission, body style, and more. Add specific keywords to search for must-have features. Call, text, or email Dealers or Private Sellers right from the app to request a quote or schedule a test drive. Cars.com and DealerRater have more dealership reviews than any other source. Read reviews from real shoppers, find hours of operation, and get directions to the dealership. Not sure what car to buy? Read reviews from our expert Cars.com Editorial Team as well as other car owners to help you make the right choice. Save your favorite cars, searches, and dealerships. Set up Price Drop Notifications to be alerted any time one of your favorite cars drops in price. Additionally, your most recent searches will automatically appear on your homepage. Use our Payment Calculator to estimate monthly car loan payments. Find out how much you can pay with our Affordability Calculator. Easily see how much your current vehicle is worth using the Trade-In Calculator. See all of the important details about a vehicle before visiting the dealership. See what Special Offers are available, including Cash Back and Special Financing, from dealers and manufacturers to save you money on your new car. Use our new Market Comparison tool to see how the price of each listing compares to matching vehicles in your area. Get advice on what a fair price is to pay for a huge variety of repairs specific to your car. Find Repair Pal Certified service centers so you can be confident the work getting done on your car is the highest quality possible. Cars.com offers three ways to sell your car. Use our Sell It Yourself listings to put an ad directly on our site. Set up an appointment to sell your car directly to a dealer in person. Or use our QuickOffer app to upload information and images of your car and get bids directly from dealers without leaving your house. The VIN Scanner allows you to quickly pull up the Cars.com listing of a vehicle while you are at a dealership by simply scanning the VIN on the window sticker. Use it to verify features or the price that was listed online. This is the car shopping tool that gives you the knowledge you need to buy the perfect car, at the perfect price, while at your home or on the dealer lot. If you experience problems with this app, send a message to [email protected] Please include the device and Android version you are using. Thanks! We’ve continued to find ways to make your car shopping experience better, while squashing a few bugs that were affecting a few of you. The Cars.com Mobile App Team.